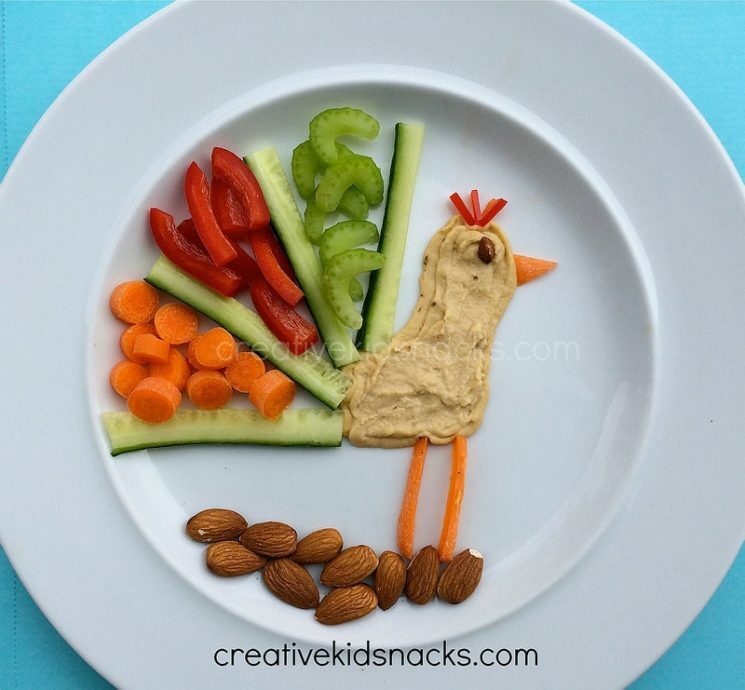 Snacks for kids are important for several reasons. Snacks can manage a child’s hunger between meals, provide energy, and boost nutrition. How do snacks boost nutrition? Snacks have the wonderful power of filling in for food groups and/or nutrients that were missed during mealtimes. With MyPlate as your guide for meals, you’ll easily be able to discern what you could serve for snack that would complete the recommended servings from the five food groups for the day. For instance, a delicious breakfast of scrambled eggs, toast, strawberries and milk has no vegetables. Not a problem, though, because now you have your snack inspiration. 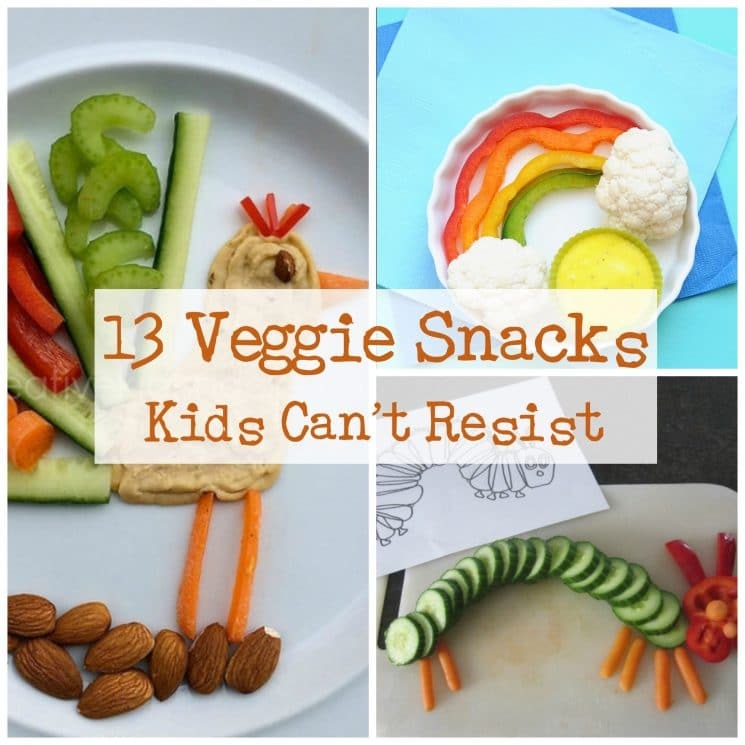 For a snack that focuses on veggies and is equally fun to make and eat, we have 13 veggie snacks that your child can’t resist. Presentation can make the vegetables more inviting and enjoyable, and we have some excellent presentation ideas for you. 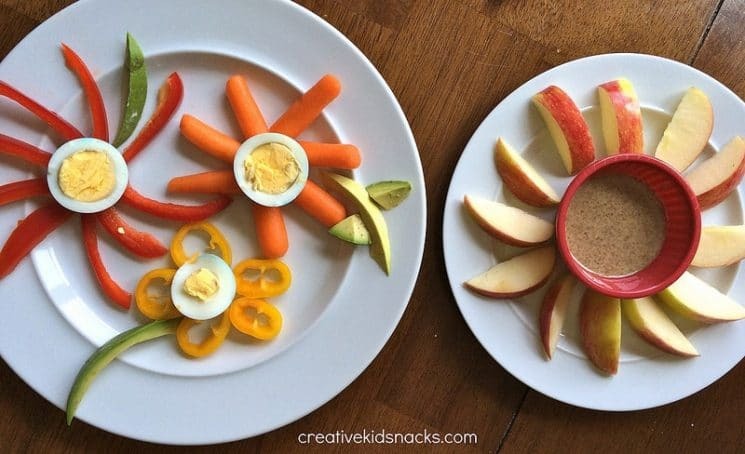 As a bonus, many of these snacks can be made with your little chef working as a kitchen assistant doing age appropriate tasks. 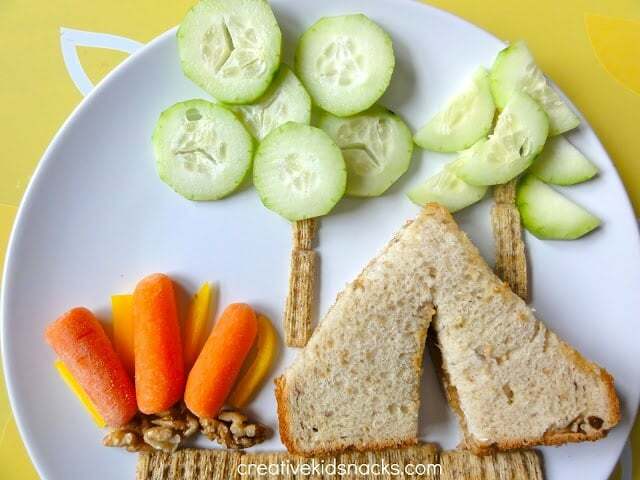 For snack, use the cucumber and whole wheat cracker trees and carrot and walnut campfire, and for a lunch, you could add a nut butter sandwich tent. It’s simple to throw together this camp scene and will surely bring excitement and enjoyment to the table. Your boat, water, fishing, or outdoor loving child is bound to love this tuna and veggie boat. Get all hands on deck for the snack construction fun. With cucumbers, bell peppers, and cherry tomatoes involved, there are several flavors ready to be savored. Bug-loving adventurers will swarm to catch these adorable veggie critters. 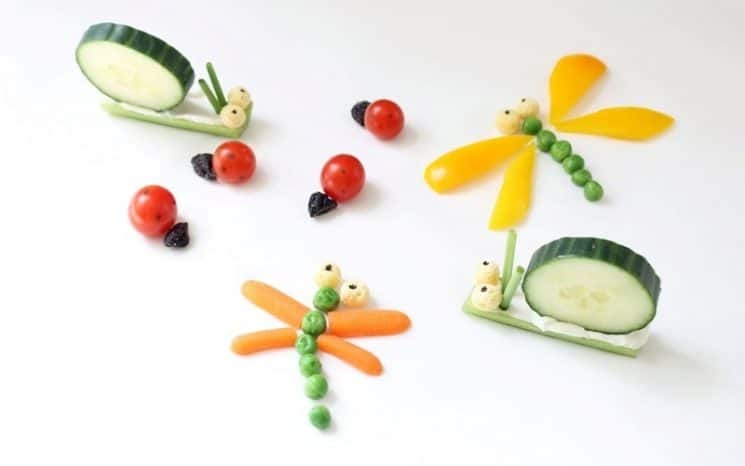 Pick from celery and cucumber snails, pea and carrot or pepper dragonflies, or cherry tomato and olive lady bugs or make them all and challenge your child to be the (snack) bug-catching master. 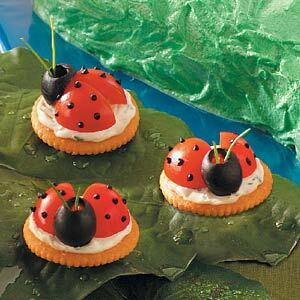 Pair this snack with a book, such as The Grouchy Ladybug, for extra fun. Then serve these adorable and colorful ladybugs. To boost the nutrition, use a whole wheat cracker, and instead of using cream cheese and sour cream as the base, try homemade or store bought hummus. 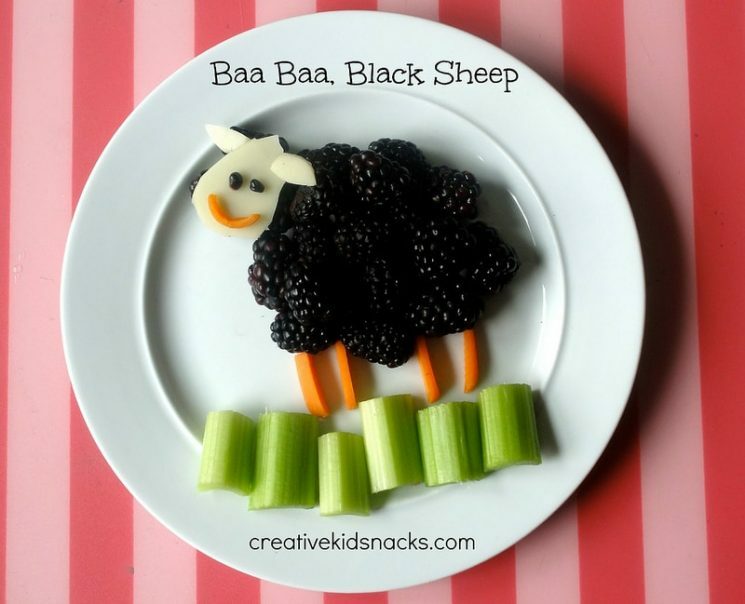 This is another fun snack to pair with a book, such as Moo Baa La La La or Sheep in a Jeep, or to serve in conjunction with a nursery rhyme. Follow the instructions in the link, but you can use black olive halves as the body to make your adorable sheep. To make a white sheep, use cauliflower florets as the body and a black olive as the head. Cauliflower sheep–This cauliflower sheep is as yummy as it is cute. Since the construction requires several toothpicks; however, make sure that it is age appropriate and that your child knows that there are toothpicks holding the sheep together. 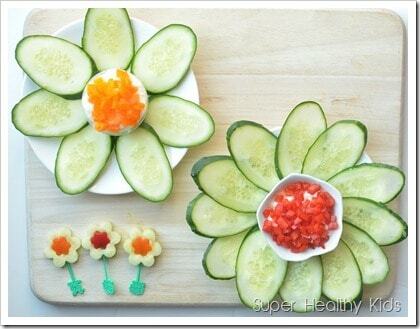 Flowers – Any flower or gardening fan can relish bringing the garden flowers onto the snack plate with these tasty veggie flower creations. Whether you make the whole train or just one train car for you and your conductor to share, this treat is a visual as well as a tummy pleaser. Fans of anything train or vehicle related will dig this presentation. One of our favorite books, which would pair well with this snack, is Chugga Chugga Choo Choo. 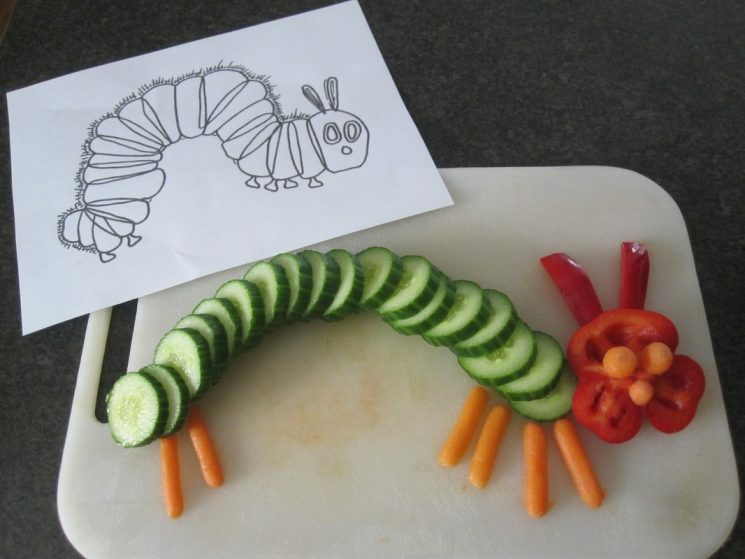 Use the photo and directions as your inspiration, but you can adapt the train concept to a variety of vegetables. 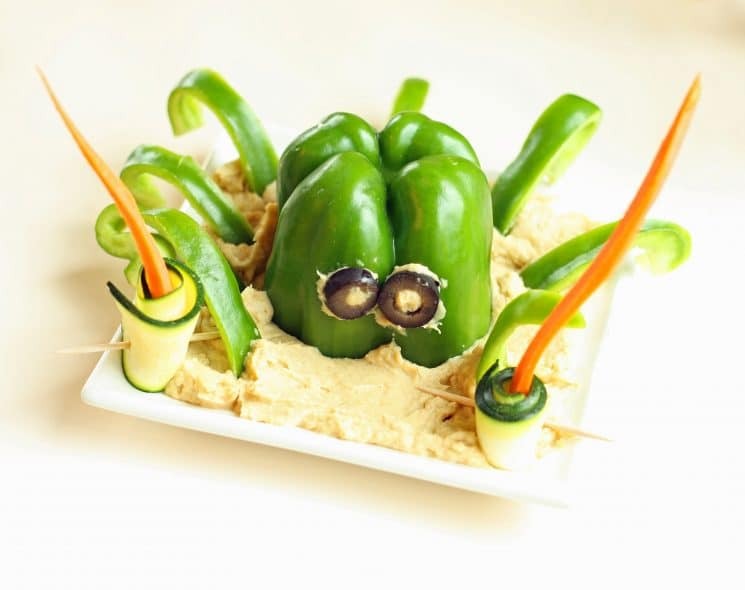 Hummus and bell pepper are delicious as they are, but turned into an octopus in a sea of hummus makes them all the more inviting. 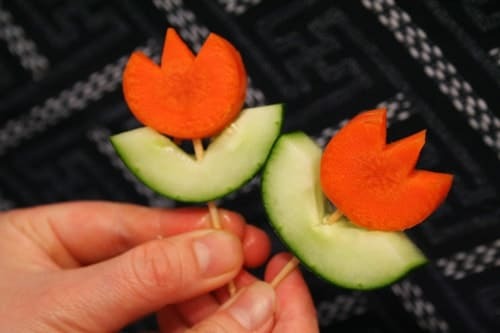 Bell pepper butterflies, rather than bell pepper sticks, add fun to snack time. You can pair this snack along with a nature walk where you and your child are butterfly spotters. Reading The Very Hungary Caterpillar and having a themed snack to go along with it adds extra enjoyment and a nutritious snack to storytime. A veggie rainbow can be enjoyed as a fantastic anytime snack or with books about color, a rainy day, St. Patrick’s Day and more. 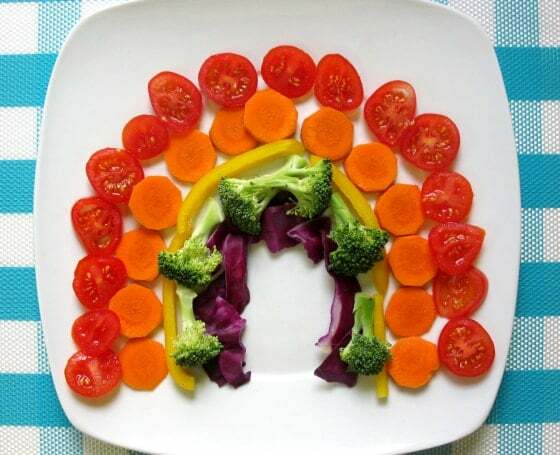 This beautiful and colorful rainbow offers your child such a lovely variety of veggies, including cherry tomatoes, carrots, bell pepper, broccoli, and purple cabbage. 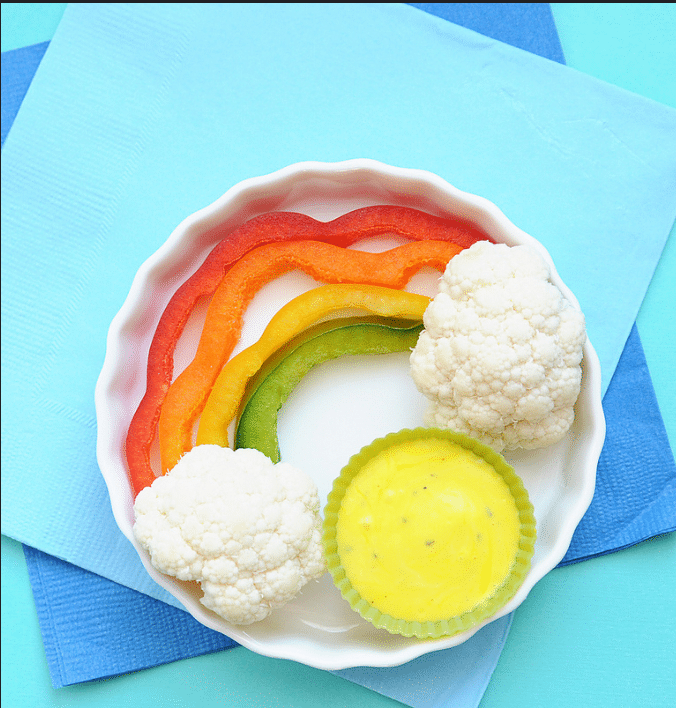 This multi-color bell pepper and cauliflower rainbow is simple yet visually appealing and tasty. Your child can help by creating the rainbow then adding the cauliflower clouds. 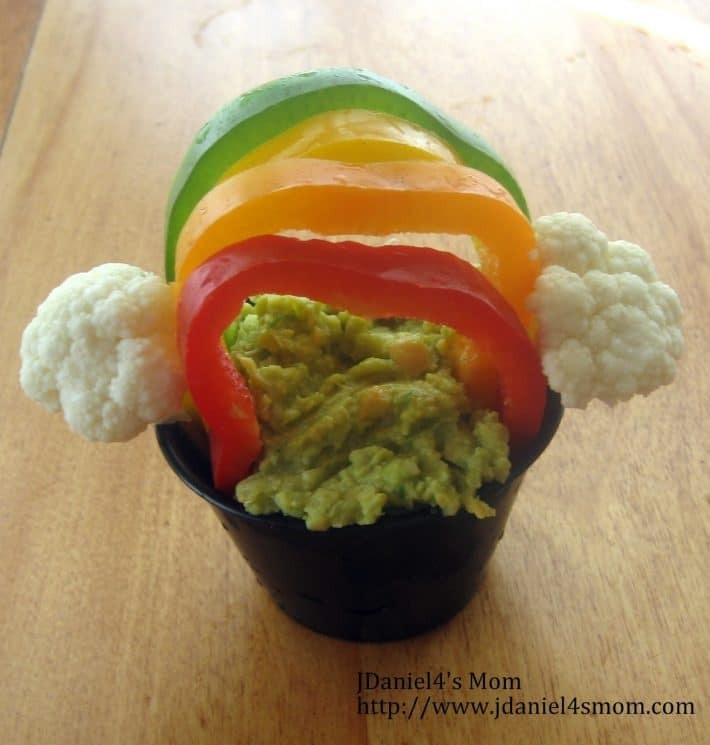 Multi-color bell pepper arches combined with cauliflower clouds set in spinach and artichoke hummus add another variation to a veggie rainbow presentation. A peacock’s colorful plume is made irresistible with celery, cucumber, carrots, and red bell pepper and served with a hummus peacock body. 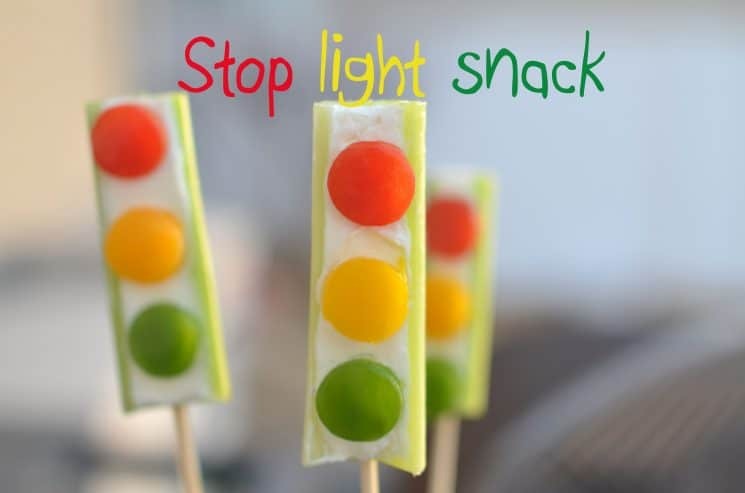 You transportation enthusiast will not be able to cruise by these deliciously bright and appealing stop light snacks without stopping by for a nibble or two. 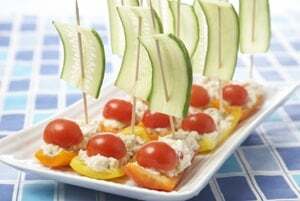 Whether you are crafty or not, these simple yet fun and exciting snacks can turn veggie preparation and eating into a successful mission. Great ideas! Thanks for including us in this awesome list! Thanks so much for sharing this post! 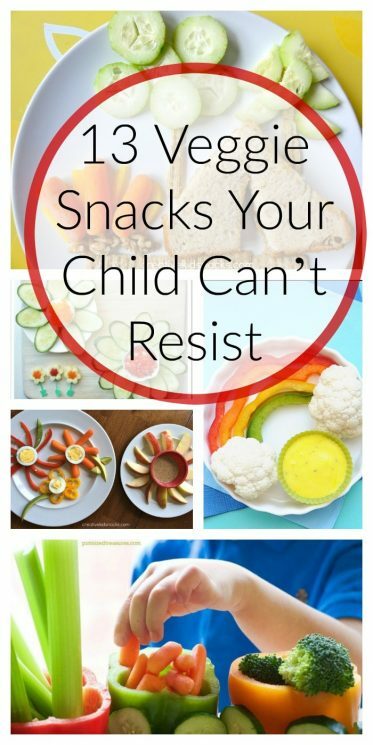 It can be so difficult to get kids to eat their vegetables, but these snacks all seem delicious! 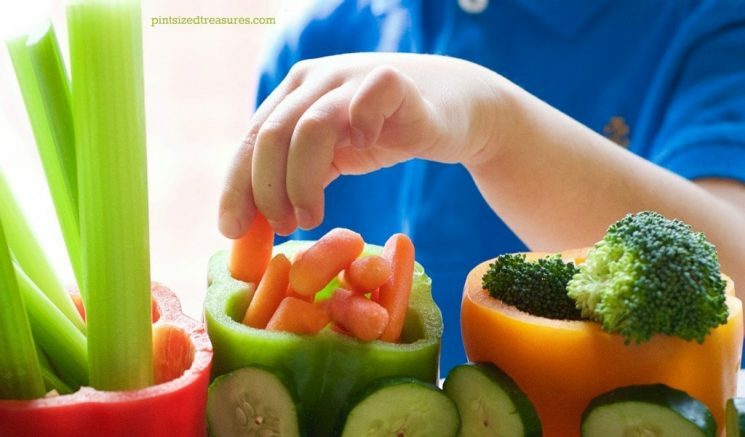 Presentation is definitely one of the best ways to get a kid to want to eat something!